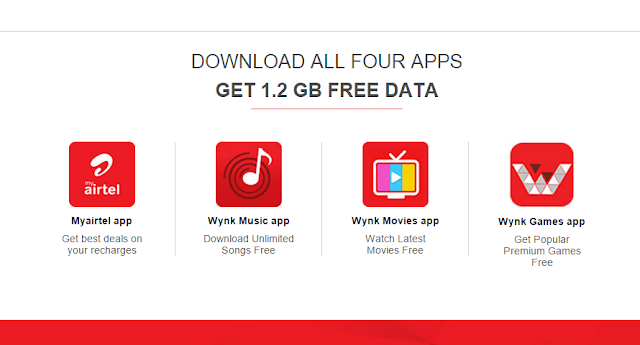 Airtel is Still Giving 1.2 GB Night Data Just By Downloading their 4 Official Apps. The Offer will be delivered in 100 MB installments each valid for 7 days from the date of credit of such installment. To avail the Offer, Users will be required to follow the following steps. • You will see list of four apps there. • Just Scroll down > Enter your mobile number and you will get the link via message. • Download the apps from the link you received. • After installation of all apps you will get free data. -The free 1.2 GB offer is available for all Airtel Prepaid subscribers (User) in India starting from 7th January, 2016 (“Offer”). -/This offer entitles the Users to get free data up to 1.2 GB, which can be used only at Night (from 12 AM to 6 AM) at the existing speed which the User has subscribed to. - The differential of 28.8 MB between 1200 MB which is 12 installments of 100 MB each and 1.2 GB shall be credited as and when the Users complete the steps as laid down above to avail the Offer across all the apps, along with the 12th installment. – Wynk Games: Android users. - This offer cannot be combined with existing 50% Night Cashback Offer on Airtel Prepaid.